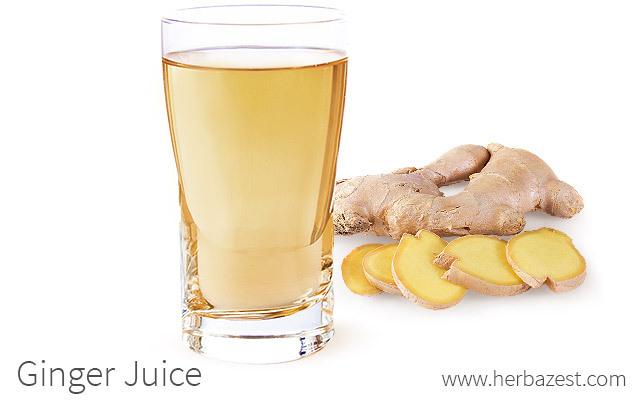 Drinking herbal juice is an excellent and concentrated way to reap the benefits of many herbs, ginger included. Ginger root juice is very simple to prepare, therefore making it an easy and healthy complement to your diet. You can even be creative and combine ginger juice with other fruits and vegetable juices for added nutritional value and flavor! Clean and chop two pieces of fresh ginger root into one-inch (2.5 cm) cubes. Combine the chopped ginger root in a blender with 20 ounces (600 mL) of water and blend until you have a pulpy mixture. Strain the mixture by pressing it through a fine sieve or strainer. This will yield approximately two servings. Alternatively, you may use a juicer or grate fresh ginger and squeeze the juice through a cheesecloth to achieve a purer ginger juice. However, this method will produce a very potent, spicy juice. For that reason, you may want to combine the ginger juice with water. Because the taste of ginger juice is pungent, strong, and spicy, it is common to dissolve sugar or add honey to taste. However, you may want to include other fruits and vegetables in your ginger juice for added flavor or nutrition. To do this, simply cut the fruits or vegetables of your choice into small cubes and combine them in the blender with the ginger and water mixture. You may also use a juicer. Some common fruits and vegetables you may want to consider mixing with ginger juice include lemon, pear, carrot, and apple. The benefits of ginger juice are many and may help treat a number of common health problems. Ginger juice has antiemetic effects and can be used to treat nausea, vomiting, and symptoms of the common cold. In fact, research published in the Journal of the Medical Association of Thailand (2007) and The Lancet (1982) has shown ginger to be better than dimenhydrinate in treating motion sickness and pregnancy-related nausea. The benefits of ginger for inflammation can be fully obtained in juice form. Drinking it help reduce the pain caused by headaches, migraines, and even arthritis. Moreover, as a result of ginger's antioxidant properties, ginger juice is useful in reducing the harmful activity of free radicals in the body. Since oxidative stress has been linked to many serious health conditions, such as diabetes and obesity, incorporating ginger root juice into a healthy diet may help treat and prevent those conditions. While there are many health benefits of drinking ginger juice, ginger should never be consumed in excess. Though it is rare to experience ginger side effects, in extremely high doses, this root can cause mild heartburn, diarrhea, and upset stomach. It may also interact with anesthesia, blood-thinning medications, diabetes medications, and high blood pressure medications. In any form, ginger consumption should not exceed the daily limit of four grams of ginger root in adults and one gram during pregnancy and breastfeeding. Be sure to consult your doctor concerning the right dosage for you. Ginger should not be given to children under the age of two. Ginger root juice is a refreshing and flavorful beverage that is easy to mix with other fruits and vegetables. It is also a simple way of reaping ginger health benefits and adding a tasty spice to your diet.